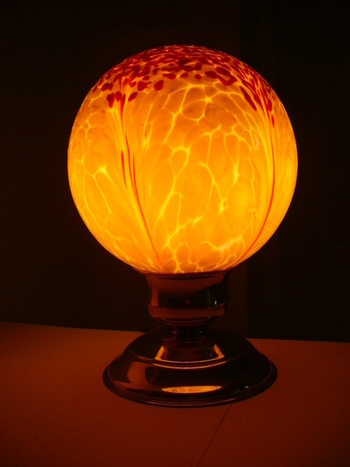 In Art Glass > Bohemian Art Glass > Show & Tell and Lamps > Show & Tell. 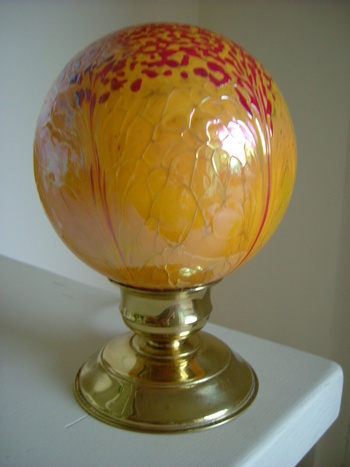 You may recall that I posted this Art Deco globe lamp shade a couple of months ago. Luckily I chanced upon a suitable base this week and here it is. It looks altogether better lit and gives the hall a mellow glow. The base is the shape I wanted and I am pleased that the shade is fitted without visible screws. However I would have preferred gun metal or black so I'll keep looking. In the meantime I can at least enjoy having it lit. Thank you SEAN, and both parts found in charity shops!.......possibly the equivalent of your 'thrift' and 'goodwill'. Looks like lava! Organic and wonderful.....amazing how the light gives things life. Thank you, czechman, aghcollect, vetraio, geo26e, terrtic, smiata, Elisabethan, AnneL, toolate, mikelv and racer for the love. Beautiful marriage of the two parts, I like the brass coloured base but you could also consider something in chrome when you are looking around. Thank you, Gracay, a good suggestion and certainly more in keeping with the period than brass. However it is really hard to find something that meets all the criteria. Thank you, LeahG, antiquerose, MacArt and jack1989 for the love. Hi Phil, thank you for taking the trouble to share your knowledge. I am still looking for something better so it's useful. Thank you Edievintage, glad you 'loved' it. i would kill for one. i bought a tripple elephant one years ago for 250 dollars. crazy i know. broke it a week later. only wanted it for the globe. now i have the elephant base and no beautiful globe. doh. Glad you like it so much. I didn't know what it was when I bought it. Yesterday someone told me. Read it on my earlier post about this globe. Thank you angelhair for the love. Thanks, CindB.....it's real strength is that it makes the hall look as if it is lit by candles. Hmmm, Cindy.....do they still exist? 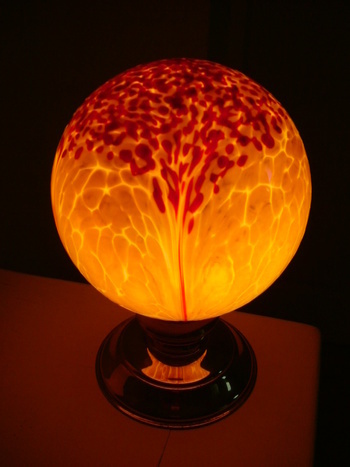 It would light your oil painting beautifully! It may not be exactly what you wanted but this looks really good love the colours. Yes, Zowie, most people here are great and some are exceptionally kind. is there any chance you can adopt me and I can borrow this next weekend?